Happy 6th+ Year Anniversary to Geauga Lake Being Closed – NOT! – A Revitalization Idea! I just saw that it has been 6+ years since Geauga Lake in Northeast Ohio closed out of nowhere on the last day of the season! Like everyone else that grew up in Northeast Ohio, this was devastating to me. This is part of where we grew up, we had season tickets, we went there every weekend as teenagers. Hundreds if not thousands of memories were made. In reality, I always knew growing up that this could happen to an amusement park, just never though it would be my amusement park! I always had a fascination for Euclid Beach Park and it’s closure. I read many books, but still could never understand why a park would close. The fun, the memories, the screams, the laughter, why, how, could it happen? As I became older and wiser, I realized, it all comes down to MONEY. Money is probably what has caused the land to sit empty for 6 years. Money is why no one wants to buy the land. Money is why no one can figure out what to do with The Big Dipper. Honestly, it’s been a recession, who wants it? I’m not here to disrespect Cedar Fair or talk about what happened. I’m here to present my proposal for the land. I heard today that a trustee thought a medical campus would be a good idea for the land. I laughed. Why does the Cleveland area need another hospital complex? Screen shot of my design for Geauga Lake. The Yellow Areas are public spaces that provide entertainment for anyone entering the park, these include rides and the beach. The whole park would be open to the public, with pay for use on the rides and attractions. The beach would be free, with revenue coming in from concessions, drinks, non power boat rental and umbrella/chair rental! The new attractions would be on the smaller scale and could include go-karts, mini-golf, batting cages and kids rides. All of the attractions would use a smartphone app for payment and services. The Orange Area is designated to The Big Dipper, the main attraction and saving it! The Green Areas are all green space that divide commercial areas from residential areas or just provide a nice area for park space. The Blue Areas are all commercial areas for restaurants, shopping and nightlife. They also include a marina, event center and hotel! The Maroon areas are all for upscale condos, apartments, town homes and possibly single family housing. The idea is they will be close enough to walk to all of the entertainment options (and possibly work) in the blue areas, but far enough away that noise will not be a huge concern. 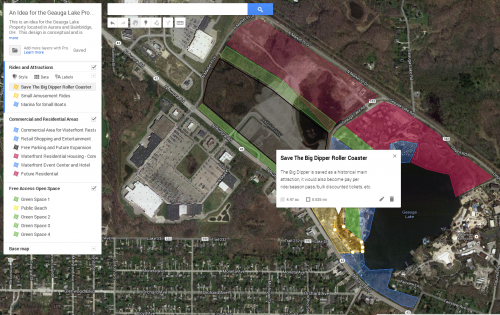 A shuttle/trolley service could be designed to easily move people around the new Geauga Lake. I don’t know anything. I have not done any cost analysis, acre analysis, city/township border analysis, etc. I assume it’s in the billions of dollars to complete. It sounds like a fun place to live; if it gets built, I will live there. This is just an idea I came up with in my spare time. I don’t have any affiliation with Aurora, OH or Bainbridge Township, OH. I just think it’s the best idea I have heard. Let’s be honest, the park is not going to ever go back to it’s former glory days and this seems like a good plan to make it a fun place to live and/or visit. Let’s bring back the 1887 days? I currently live out of state and have no idea if this kind of mixed use development would work where Geauga Lake it located. I don’t even really know or understand what all that big box shopping is around it. This design is conceptual and is created by Dan Murry – http://dmurry.com – It may not be used or reproduced without written permission from author. 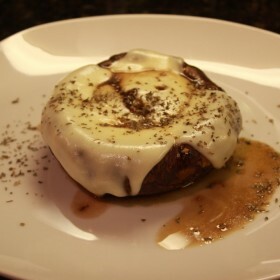 Today at my local grocery store, I saw some prepackaged stuffed portobello mushrooms and almost purchased them. In the end, I decided to make my own. They were fairly easy and delicious! Prepare the mushrooms by cleaning them gently with a damp paper towel, then mince the shallot and garlic cloves together. Combine shallots, garlic, olive oil and vinegar in a small bowl. I do not usually measure the olive oil and vinegar, but rather mix it together by taste. Just make enough to fill the gills of the mushroom and coat the other side of both the mushroom caps. Place mushroom caps with the gills side up in a bowl and cover with the mixture. Let marinate for 30 mins to 1 hour and add 2 slices/pieces of mozzarella cheese. Cook about 15 mins on low heat in a cast iron grill pan, outdoor grill, or saute pan. Keep covered to melt the cheese. 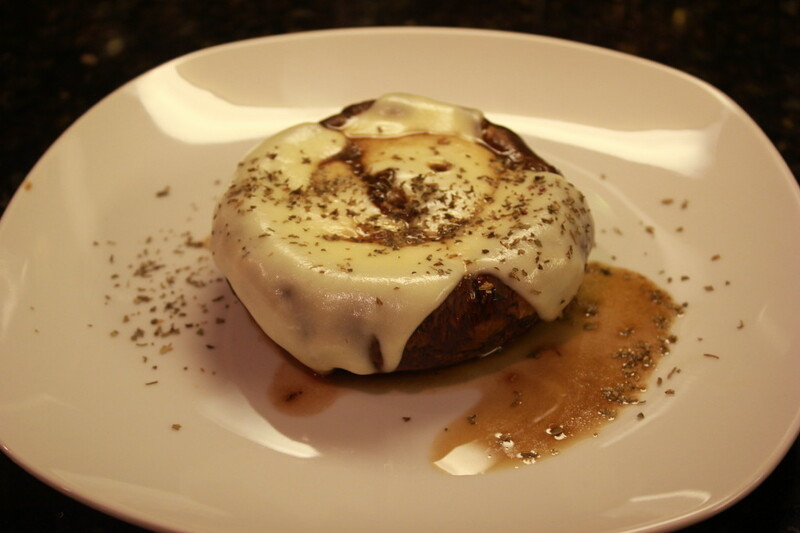 The mushroom should be firm to the touch, but not soggy with the juices flowing out of it. Sprinkle with basil and enjoy! Snow is Here! Top 10 Ice and Snow Driving Tips! Top 10 Ice and Snow Driving Tips! Slow Down! – #1 tip, drive significantly slower than if the roads were clear. Appropriate Tires – have all-season (or better yet snow tires) on your car; a BMW M3 with high performance tires is not going to make it up a hill, stay at home! Check your Tread Depth – if the tires are low on tread be extra careful, if they are bald and the core is visible, stay at home! Relax and Stay Calm – Sudden braking, accelerating and/or turning is problematic; slowly take your foot off the gas if you start to slide until you regain control. See #5. Turn into a Slide – If the back end is going right, turn the wheel right. This is not necessarily instinctive, practice putting your car into a slide (at your own risk!) in an open parking lot and removing from it to learn. Leave Room – keep plenty of distance between vehicles, see #6. 4 Wheel Drive/All Wheel Drive – Just because you have it, doesn’t mean you will not slide. It only helps in accelerating and climbing hills. Slow Down! – See #1. Are there any other important ones I missed? Please post in the comments! This is a follow up to my post on Open Source Video Editing as I was not able to find an adequate open source program that would accomplish transitions and title screens. Eventually, I discovered that Windows includes Windows Movie Maker with Windows XP SP2 or later. At first glance, it looks like it will accomplish everything I need. One problem, it will not directly open my DVD video files. After further research, it appears that Avidemux will convert DVD to AVI or MPEG2. Windows Movie Maker does not appear to support MPEG4, DiVX or Xvid. This is fine as I want the final movie I create to be playable on any computer without having to download a codec. Windows Movie Maker was very successful and easy to use to complete my quick project by allowing me to add a title screen, remove the background audio, add music, sequence everything correctly and add some credits at the end. The whole project took less than 30 minutes and had the ability to save the file in the WMA format which was easy to play on any Windows based computer. Update: Windows Movie Maker is now part of the Windows Live Essentials 2011 pack and is available for download for free from Microsoft. The goal of this project is to figure out how to take multiple DVD video files (*.VOB) from a Sony Handy Cam and compile them all into one video with various transitions, effects and title screens. The program I use does not have to be anything fancy, but should have the basics mentioned above. I am by no means an expert in this subject, but I have previously used Adobe Premiere Pro with digital video (DV), capturing the video over Firewire. I am not able to use this same method as the Sony Handy Cam I am currently using records to a mini DVD. I also no longer have legal access to Adobe Premiere Pro. The first software package I tried was VirtualDub, but I got the following error when trying to open the VOB file; “MPEG Import Filter: invalid pack at position 3: marker bit not set; possibly MPEG-2 stream.” Okay, so this tells me I need to convert the video file before editing it with this program. After further investigation, it does not appear that VirtualDub is going to allow me to do transitions and title screens. It is time to search for another open source/free program. The List of free and open source software packages on Wikipedia seems like a good place to start. The first one on the list, Avidemux is able to convert my DVD based files into various file types (AVI, DVD compatible MPEG files, MP4, ASF, etc) , but still does not provide transitions or title screens. It also provides simple cutting, encoding and various filters, but not quite what I need. None of the other programs on the Wikipedia list seem to fit my needs. 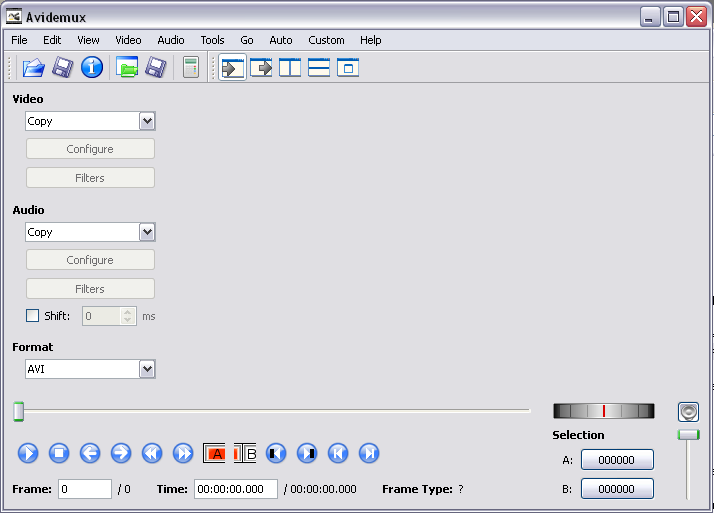 However, it does seem that there are few awesome video editors for Linux/Unix platform. I am unable to use any of these as I am limited to Windows XP. I have come to the conclusion that a good open source alternative to Adobe Premiere or Final Cut for Windows does not exist right now. Does anyone else know of one? This recipe is a modification from my classic turkey burgers in that it provides a bit more kick. The heat factor is fairly moderate, but that will vary depending on how hot and how many jalapenos used. Preheat outdoor grill, indoor electric grill or grill pan. Spray or coat with oil if not nonstick. Scramble egg in medium sized mixing bowl. Add ground turkey, red onion, garlic, jalapenos and spices. Mix gently with hands, try not to over mix as this will cause the meat to break up into fine pieces. During the mixing process slowly add the breadcrumbs. The egg and breadcrumbs help hold the turkey together, while retaining moisture. Gently form into 4-5 burger patties. The meat needs to be packed fairly tight to not fall apart, but not over packed to cause dry firm burgers. Grill on high heat for 5 to 10 minutes per side or to 165° F internal temperature. It is important not to flip or move the burgers until the first side has created a crust along the grill grates. Melt pepper jack cheese on top during last few minutes of grilling. Add fresh sliced tomatoes and turkey burger to a bun. Enjoy! If one has ever experienced a problem with playing an audio or video file on a Windows based computer with Windows Media Player or any other player then a codec might need to be installed. A codec allows encoding or decoding of digital data (video, audio, etc). Currently, the K-Lite Codec Pack is in version 4.8.2 available at http://www.codecguide.com/ It provides all the different codecs available in six different configuration packages from Basic, Standard, Full, Mega, Corporate to 64-bit. The basic package contains all of the general codecs and will not install a seperate player onto your system. It will use Windows Media Player to play most of the standard types of files. This might be a useful package to install on a business oriented computer that contains only the essential programs to perform the task. The standard package includes a copy of Media Player Classic – Homecinema, MPEG-2 for DVD playback, FLAC and Wavpack audio files. It is an extremely useful media player with many different options for playback, but is very minimilistic in design and most importantly on system resources. It is modeled after Windows Media Player v6.4. This version is fairly complete and useful for users wanting most of the features in a relatively small package. The full package contains more codecs for audio and video decoding and encoding including the lossless audio formats for any audiophiles out there. However, the only real advantage to installing the Full Package over the Mega package is if Real Alternative is not needed. Real Alternative allows the playback of all RealMedia formats without having to install RealPlayer and tying up even more system resources with another media player. 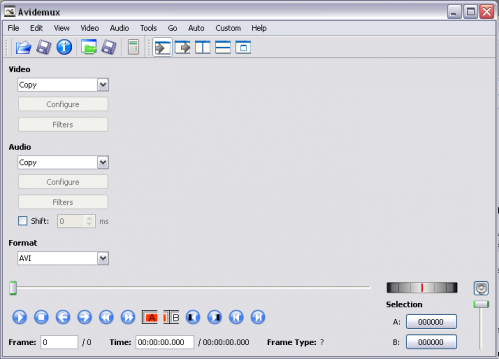 Mega includes even more codecs to play or encode any sort of audio or video formats and includes RealPlayer. This is the package that most PC power users, like myself, would want to install. On top of this, it is also useful to install Quicktime Alternative to avoid having to install iTunes and any other Appleware to be able to play the Quicktime format. The corporate package is similar in contents to the full package, but has a strong focus on open source software. The 64-bit package provides the codecs that have been optimized to run on 64-bit versions of Windows. However, since a good majority of programs are still 32-bit versions running on 64-bit versions of Windows it is recommended to also install one of the 32-bit packages from above. Cannot install anything? Do not have administrative privleges? Then VLC Player is the correct player to use. It includes its own plugins for playing most movie and audio formats so it does not need any codecs to be installed. It is even packaged in a Portable App for easy download and “installation” to a portable USB drive. http://www./ on Happy 6th+ Year Anniversary to Geauga Lake Being Closed – NOT! – A Revitalization Idea! http://www./ on “Ohio State is once again the biggest university in the nation.” and advice. prestamos dinero bogota on “Ohio State is once again the biggest university in the nation.” and advice.